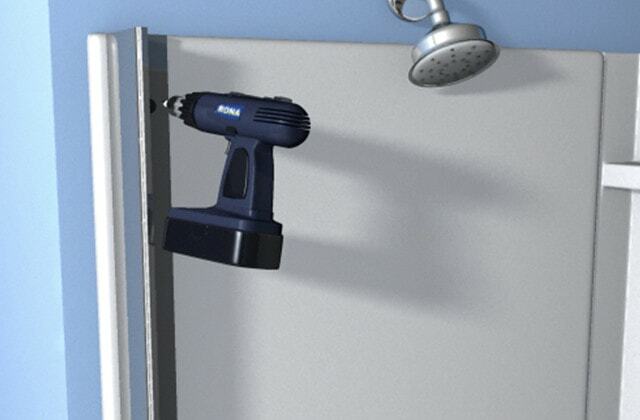 Are you upgrading your existing shower, or installing a brand new bathroom? 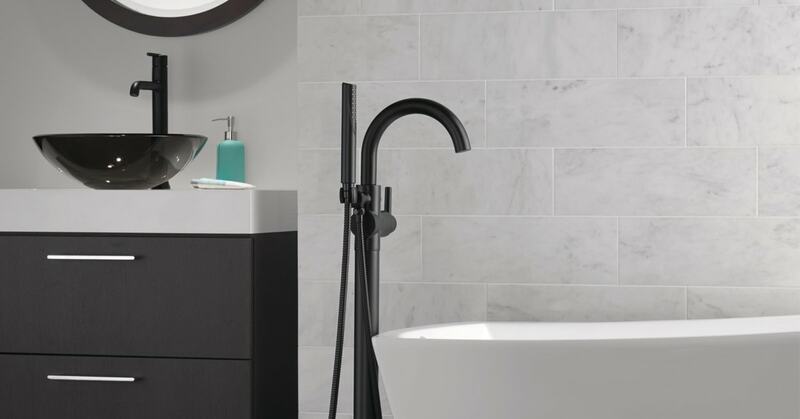 Either way, this is the perfect opportunity to improve the functionality of your bathroom and introduce a new style element at the same time. Don't forget: new fixtures are as likely to improve water efficiency as they are to make you smile. 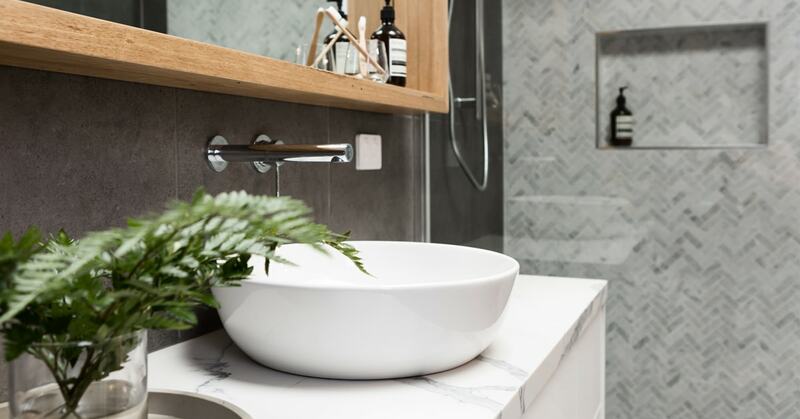 Bathrooms are essential, so go ahead and make yours essentially your own! This project details the installation of a shower base, wall panels and door. The rough plumbing must be in place prior to installation. For the installation of a shower base only, go to steps 1-5. 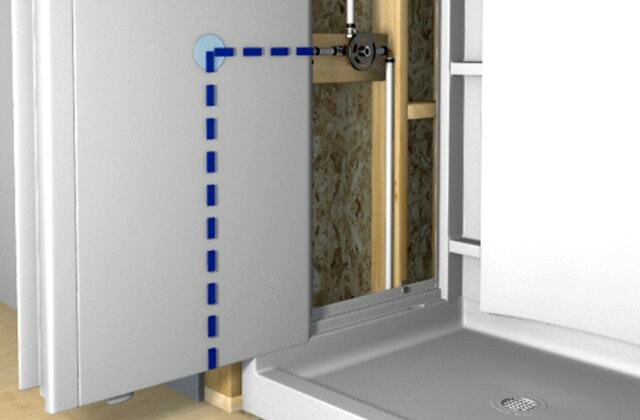 For the installation of a pivot door, go to step 7. Read the project Install a bath or shower faucet for more information. Ensure the framing meets the manufacturer's specifications. 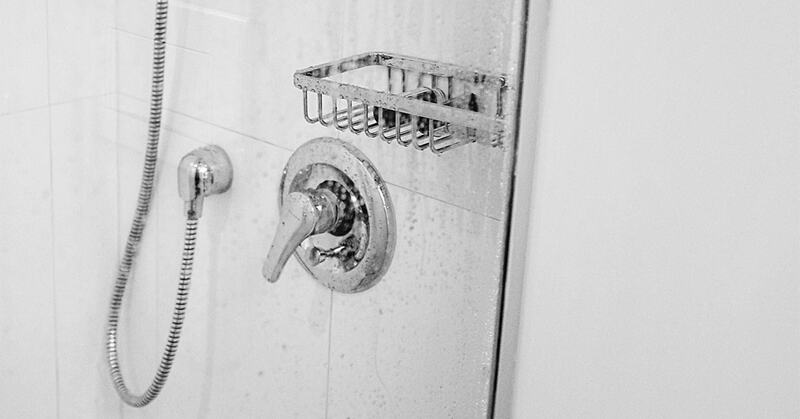 For example, certain manufacturers require studs spaced at 12" intervals to support the shower stall instead of the standard 16" intervals. 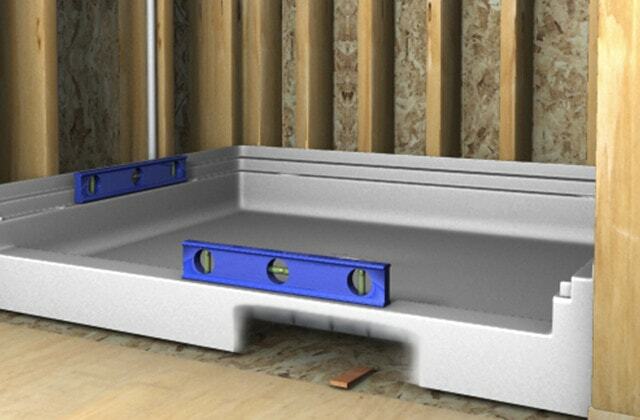 It is preferable to set the prefabricated shower base in cement or on a concrete slab subfloor. 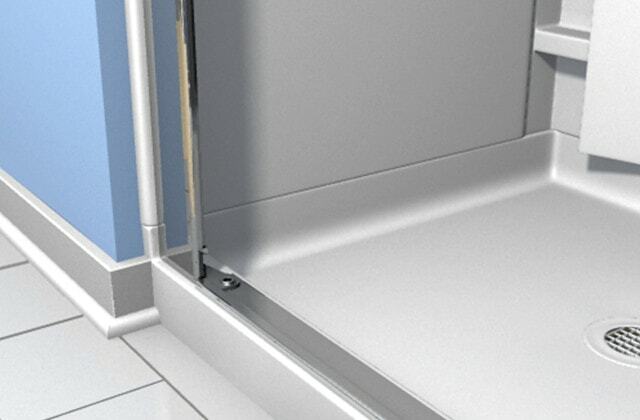 Throughout the installation, protect the interior surface of the shower base with thick cardboard or a protective cover. 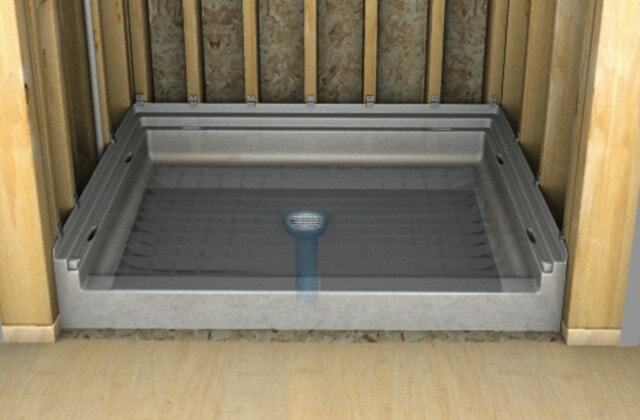 1.1 - Block the drain with a properly-fitting ABS cap or a clean rag. 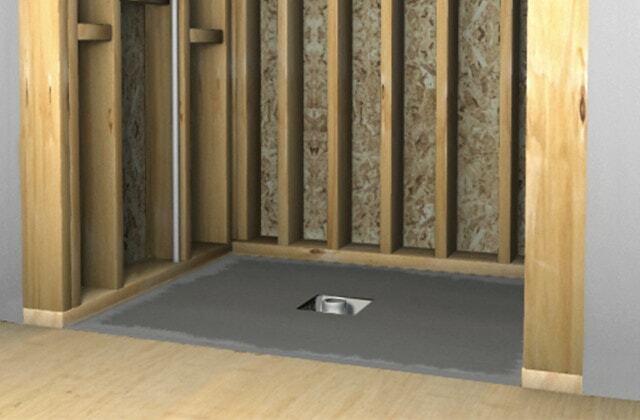 1.2 - Measure the floor space as well as the exact location of the drain pipe. 1.3 - Cut the cement board, then cut the opening for the drain with a 3 ¼" hole saw. 1.4 - Check that the panel fits well on the frame and that the opening is located where it should be. 1.5 - Glue the cement board panels to the subfloor with construction adhesive. 1.6 - Remove the ABS cap or rag. 1.7 - Measure the height of the drain pipe, which should stand 1/2" proud of the floor. Cut the excess. 1.8 - Put a plastic bag over the drainpipe and secure with a tie wrap. 1.9 - If needed, add wood studs on each side at the front of the shower to support the pivot door. Plastic or fibreglass structures are not solid enough on their own. For a shower that will have tiled walls, apply a bead of silicone sealant to the tiling flange and screw to the sides of the shower base. 2.1 - Test fit the base to make sure the drain is aligned with the opening. 2.2 - Check for level and ensure that the gap between the studs and the edge of the base is no more than 1/8". Insert shims under the base if necessary. 2.3 - Mark the top edge of the base on all three sides. 3.1 - Run a bead of sealant under the body of the drain. 3.2 - Insert the body of the drain (5) into the opening in the shower base. 3.3 - Insert the rubber gasket (6) on the threaded end under the shower base. Press down. 3.4 - Place the fibre gasket (7) on the rubber gasket, then screw on the nut (8). Tighten a ¾ turn with a wrench, but do not over-tighten. 3.5 - Put dishwashing liquid on the end of the body of the bottom drain (5) and drain pipe to make it easier to connect them. 4.1 - Spread out a 1" layer of self-compacting concrete. Protect the drain area. Set in the base and line up the drain pipe with the bottom drain. 4.2 - Press down so that there is good contact with the concrete. 4.3 - Ensure that the top edge is aligned with the marks on the studs and that the base is level. 4.4 - Protect the base with a protective sheet. 4.5 - Screw the base into the studs or fasten to the studs with clips provided by the manufacturer. 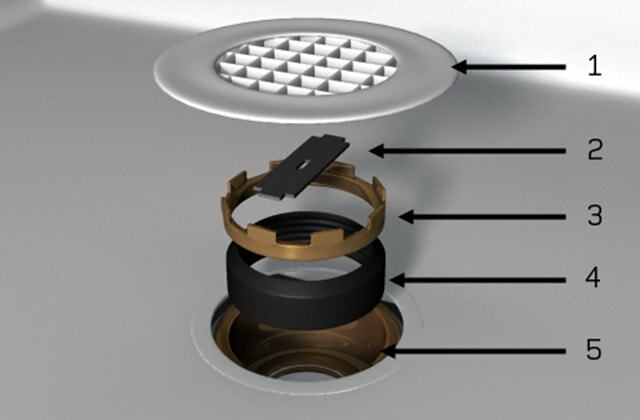 5.1 - Coat the neoprene ring (4) with a silicone lubricant, then insert it into the top part of the drain (5). 5.2 - Screw the threaded ring (3) onto the drain (5) and tighten. 5.3 - Clean the drain and remove any residue. 5.4 - Insert the strainer (1). 5.5 - Plug the drain again. 5.6 - Pour some water into the shower base and check for leaks. Bubbles around the drain indicate leaking. 5.7 - Unplug the drain. 5.8 - Ensure there isn't any water accumulation and that water is flowing properly. This section deals with modular showers with wall panels and does not detail tile or drywall installation. Make sure there is wood framing behind the front of the wall panels to install the pivot door. 6.1 - Install the back panel and insert the tabs into the appropriate slots in the base. 6.2 - Measure and mark on the wall the location for the faucet, shower head, and spout. Verify with the template provided by the manufacturer to ensure the locations match. 6.3 - If a template has not been included with your plumbing hardware, take a large piece of cardboard and press it against the wall where the faucets will be installed. The outline of the different elements will make a mark on the cardboard. Remove the cardboard. 6.4 - Press the cardboard against the shower wall panel and transfer the markings for the location of the plumbing fixtures. 6.5 - Compare the measurements on the cardboard to the measurements on the wall. 6.6 - Determine the dimension of the hole for the tap valve. 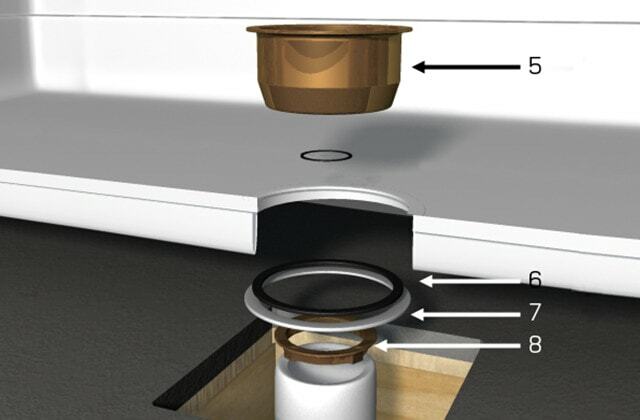 Ensure the decorative cover plate will cover the hole. 6.7 - Use a hole saw to drill a hole for the valve. 6.8 - Slide in the panel, top first. Align the valve with the hole in the panel. 6.9 - Firmly press the panel against the studs. 6.10 - Slide in the last panel, starting at the top. 6.11 - Correctly align the bottom of the panels with the edge of the base. The gap between the panels and edge of the base must not exceed 1/32". 6.12 - Check the walls for plumb. 6.13 - Secure the front of the panels to the studs, from bottom to top. 6.14 - Use galvanized screws to secure the top. Shim where necessary. 6.15 - Cover the tops of the panels with water-resistant moulding. 6.16 - Install the faucets according to the manufacturer's instructions. 6.17 - Apply silicone sealant to waterproof all joints, including the decorative cover plate. 7.1 - Determine how you want the door to open. 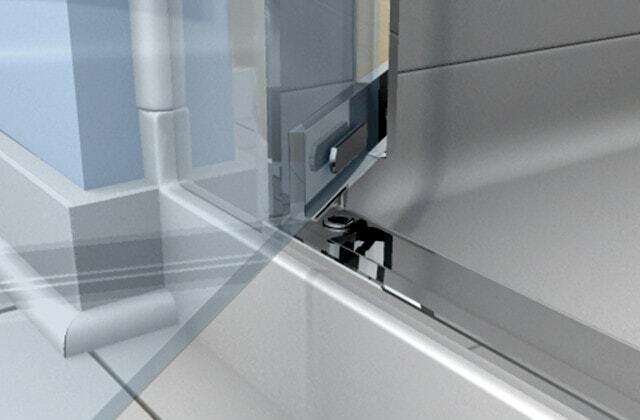 The pivot hinges will be installed on the side opposite the shower head. 7.2 - Mark the location of the threshold, 1/8" from the inside edge. 7.3 - Measure the width of the shower base. 7.4 - Cut the base track to this measurement, less 1/16". 7.5 - Run a bead of silicone sealant under the threshold and secure to the base at the previously marked locations. 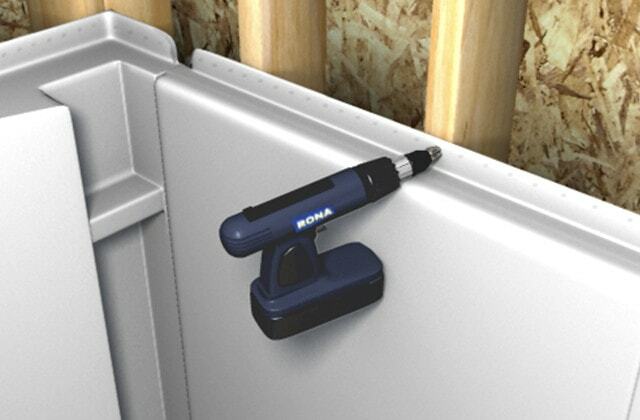 7.6 - Install the pivot hinges at the two ends of the stud. 7.7 - Place the pivot jamb against the wall and on the threshold. Level vertically. 7.8 - Mark the location of the screw holes and remove the jamb. 7.9 - Drill the screw holes and screw the jamb to the structure. 7.10 - Depending on the model, attach the drip rail to the bottom door frame. 7.11 - Insert the lower pivot for the bottom of the door in the threshold hinge mechanism. 7.12 - Slide the upper pivot on the door and screw in the upper hinge. 7.13 - Align the magnetic strip from the other side, on the threshold, opposite the door jamb. 7.15 - Mark the location for the screw holes and remove the jamb. 7.16 - Drill the holes and screw the jamb to the structure. 7.17 - Open and close the door to check the magnetic strips are aligned. 7.18 - Install a waterproof seal around the door. 7.19 - Insert the plastic screw plugs and caulk the jambs and threshold with bathroom sealant. Renovating the bathroom: where to start?